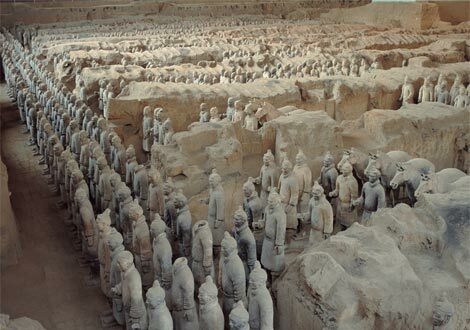 The terra cotta army was discovered near the Chinese city Xi'an, in the Shaanxi province, in 1974 when villagers were drilling a well. Archeologists found chambers with thousands of terra cotta ancient warriors, each standing around six feet tall and equipped with ancient weapons. The Terra Cotta Warriors became an immediate sensation; their discovery was one of the greatest archeological finds of the 20th century. Only the discovery of King Tuts tomb in 1922 created more excitement, and the actual tomb of the first emperor hasn’t even been opened! Around 210 B.C. 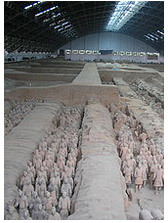 the terra cotta Warriors where constructed to accompany the first emperor of China, Qin Shi Huang, into the afterlife. Much like the Egyptians, Greeks and many other ancient cultures they believed that burying grave goods along with the deceased would help them in their afterlife. A great ruler like Qin, unmatched in Chinese history and a man of with an ego to match his authority would naturally need an exceptionally large amount of men and materials. He decided to bring his whole army. Currently it is estimated that over 8,000 warriors are located in three massive chambers. The terra cotta warriors are arrayed in battle formation and depicted with the arms and armor they would have used in battle. 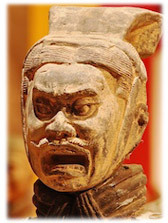 Each terra cotta warrior was based off of an actual warrior in the armies of the Qin emperor. This has been a boon for Military historians, revealing the formations, weapons and armor used by the Qin armies that united ancient China for the first time. Light shock troops were followed by heavily equipped warriors into battle. Archers supplied support while chariots and cavalry would be used to provide the knockout blow. In addition to the over 8000 warriors it is currently estimated that there are 130 chariots with 520 horses and 150 cavalry horses. The terra cotta warriors are accompanied by a host of supporting elements, generals and officials would be needed as well as porters and entertainers. Strongmen, acrobats and musicians keep the terra cotta warriors morale high in their lengthy wait for battle. Today the terra cotta warriors and their accompanying necropolis (city of the dead) are a UNESCO World Heritage Site and one of the most impressive and valuable archeological sites in China. The warriors are amazing in their artistic representation and in the massive effort required to by hundreds of thousands of workers to create them. Most of the warriors, like the grave of the emperor they protect remain unearthed, their secrets sealed for future archeologists to discover.